SALISBURY, Md. 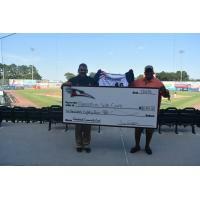 -- The Delmarva Shorebirds are proud to announce the results from the 4th of July Patriotic Jersey Auction that benefited Operation We Care, as the team presented a check for $10,084.18, which is the most any Shorebirds' jersey auction has ever brought in. "Arthur W. Perdue Stadium was packed on July 4th and we are thankful that the fans showed their support with our patriotic jersey auction that benefited a great organization in Operation We Care," Shorebirds general manager Chris Bitters said. "We are honored to help out our military via Operation We Care with the most successful jersey auction that the Shorebirds have ever had." The specialty made jerseys resembled an American flag with red and white stripes that appeared diagonally on the front and back. The white stars and blue background were included on the right shoulder of the jersey. The front of the jersey showed the Shorebirds' script that was filled with the stars and stripes of an American flag. Both sleeves and the numbers on the front and back were filled with military style blue camouflage. The Veterans of Foreign Wars of the United States emblem was also included on the right sleeve. On the back, above the numbers, the emblems of all five military branches were featured. A silent auction for the game-worn jerseys was held during the game, with Shorebirds players and coaches presenting them to the winning bidders. Delmarva has more special jersey nights scheduled in 2018, including a Christmas in August jersey auction on Friday, August 3rd, an Orange Friday jersey auction on Friday, August 17th, a Delmarva Scrapple jersey auction on Saturday, August 18th, and a Maryland Pride jersey auction on Thursday, August 30th.